Mandatory Photo Credit: Kicia Sears, The Juice Online. This week, it was No. 10 Cornell, which came in to Tuesday second in the nation in scoring, averaging 15.9 goals per game. But the No. 11 Orange stymied the Big Red’s attack in a 13-8 win in SU’s home finale. 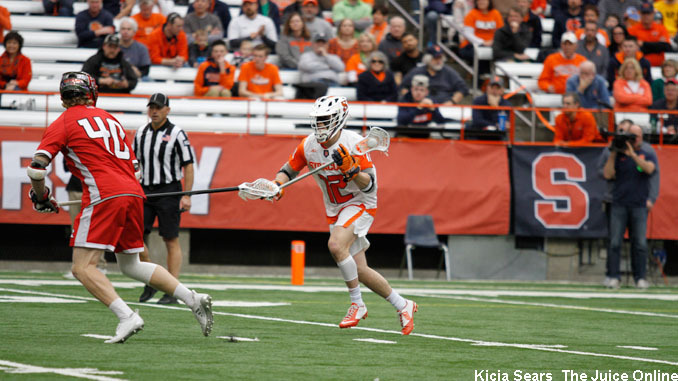 Just as impressive, Syracuse held Cornell attackman Jeff Teat two just two assists. He had come in sixth in the country totaling 5.4 points per contest. This came one week after the Orange dominated then-No. 20 Hobart, 17-5. The Statesmen had also come into that contest second in the nation in scoring at 16.1 goals per game. Syracuse’s defense was led by a dominant Drake Porter, who notched 10 saves, and Nick Mellen, who shadowed Teat all night to keep him goalless. The Orange also had the added benefit of extra possessions, with Jake Phaup (11-of-18 in faceoffs) and Danny Varello (6-for-6) controlling the X. Syracuse also dominated in ground balls, 40-22, and shots, 49-31. Syracuse surged ahead early, with Stephen Rehfuss scoring two of his three goals on the night in the opening minutes. His second with 8:09 left in the first quarter put SU up 3-0. The Orange went into half up 7-3 after Brendan Curry’s 13th goal of the season. Bradley Voight put the game out of reach early in the fourth quarter, with his unassisted goal with 13:52 left putting the Orange up 12-5. Voight also ended up with a hat trick. Cornell attackman John Piatelli led the Big Red with three goals. Syracuse will finish the ACC regular season when it plays North Carolina on Saturday.